Our favorite new super-group LSD aka Labrinth, Sia and Diplo continue to deliver top tunes. Fresh off the back of their debut 'Genius' last week, this week we're treated to 'Audio'. It's a pretty sweet summer tune, with a nice, colourful video to accompany it. Where Sia to an extent dominated their debut track, 'Audio' sees her and Labrinth getting something of a more equal share on the vocal front. They continue to seamlessly balance each other vocally, with neither overpowering the other and Diplo's production values continue to be a delight to listen to. In case you somehow missed the news, Snow Patrol are very much back with new music and a new album on the way. Their upcoming album is called "Wildness", will be out at the end of the month and 'Empress' is the third single to be taken from it, following in the footsteps of 'Life On Earth' and 'What If This Is All The Love You'll Ever Get'. It's more up tempo than the latter, but still with a really heartfelt message to it and some lovely guitars strings running throughout. 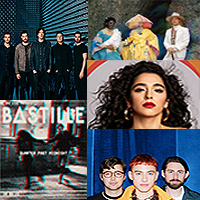 Yet another band who are returning with new music, and another single taken from their upcoming album "Palo Santo". 'If You're Over Me' is quite an emotional number, looking at the aftermath of a break-up. As I've long said the break-up genre of songs isn't anything new, but the way in which Artists approach it is. Here our injured party bemoaning their ex partner spreading lies about their relationship, and pleading with them to basically back off and stop sending mixed messages. It's the type of story that will unfortunately resonate with a lot of people, and it's told over some pretty funky beats. Kara Marni is a singer I've never heard of before, but I doubt it'll be long before she's breaking out into the mainstream. 'Love Just Ain't Enough' is my favourite type of song, starting out in one directly musically and then going into a completely different direction. The message of the song is again nothing new, but the way in which she tackles it and with quite a stellar voice is what makes this song so good. Saving the best of the best until last this week. Bastille are back with a brand new song! And as expected 'Quarter Past Midnight' is absolutely brilliant. I hope this is the start of more music from them, because I am an extremely greedy person who has already worn out their "Wild World" album. The song's message is one of positivity and looking at life, and everything that comes with it, almost reflecting upon events. At it's core, it's fun, will probably sound awesome sung live and I am counting down the days until I get a notification about a video, because this song needs one.